The Lexus LC5 00 was probably the best-looking Lexus we’ve seen for decades, even if I’m still not crazy about that grille and I know they’re hiding Egyptian symbology in the headlights. Now there’s a hybrid version, the LC 500h, and it’s an interesting mix of high-tech and a transmission that seems deceptively retro. 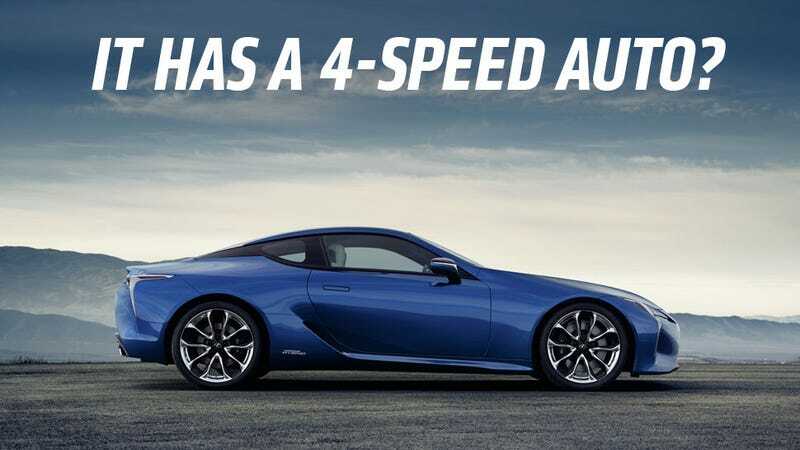 The LC 500h is using something Lexus is calling “the world’s first Multi Stage Hybrid System,” which they explain is a hybrid system designed for performance vehicles. Lexus says the goal is to get the best balance of performance and fuel consumption, as well as to create “a more sporting and engaging driving experience by closely aligning engine speed with throttle inputs,” according to their press release. What I think this means, translated from PR-speak, is that they, like every other human and higher primate on the planet, find that driving with a CVT-equipped car feels weird, and that disconnect between throttle input and engine speed is the main reason. CVT-equipped cars (which hybrids usually are) do exhibit unfamiliar-feeling traits, like the engine revving higher than the speed would suggest, or lagging when you stomp the gas. I’ve yet to meet someone who likes it. So, we’ve got a 3.5-liter V6 and an electric motor (combined HP is listed as 354HP), with , and they’re both married to a four-speed auto. The heyday of four-speed autos was in the ‘90s, and perhaps Lexus won a warehouse full of old Accord trannies at auction, but I think the real reason is to eliminate the annoying CVT feel. So, why only four speeds, in this era of seven- and nine-speed autos? I suspect it’s because for the lower-end ratios, the electric motor provides all the low-end torque needed, and more gear ranges are likely not needed there. I’m guessing a bit here, but I suspect the result is something that feels much more natural when driven hard. So, as much as I kid the throwback transmission choice, I suspect it makes a lot of sense in context. The LC5 00h is built on Lexus’ all-new rear-drive platform, called GA-L. The mass of the powertrain is behind the front axle, creating a front-mid layout, and the center of gravity is set quite low, thanks to aluminum hood and door skins, and composites for the trunk lid, among other things. It’s odd because ‘simplicity’ isn’t a word I’d use to describe any recent Lexus, and the other two things are pure PR horseshit. Seamless anticipation? Someone at Lexus please explain what the hell you mean by that. Overall, the LC 500h looks to be a very appealing car: striking looks, the potential for good performance, all with hybrid economy. I’m curious to see how it seems when it’s out in the open at the Geneva Auto Show very soon.